SN 1979C, a supernova in the galaxy M100, may be the youngest black hole in the so-called local Universe. Astronomers have seen many gamma-ray bursts, which are likely the births of young black holes, but these are much more distant. If SN 1979C does indeed contain a black hole, it will give astronomers a chance to learn more about which stars make black holes and which create neutron stars. SN 1979C was first reported by an amateur astronomer, and some 25 years later space-based telescopes picked up the case. This composite image shows a supernova within the galaxy M100 that may contain the youngest known black hole in our cosmic neighborhood. In this image, Chandra's X-rays are colored gold, while optical data from ESO's Very Large Telescope are shown in yellow-white and blue, and infrared data from Spitzer are red. The location of the supernova, known as SN 1979C, is labeled (roll your mouse over the image above to view the labeled image). SN 1979C was first reported to be seen by an amateur astronomer in 1979. 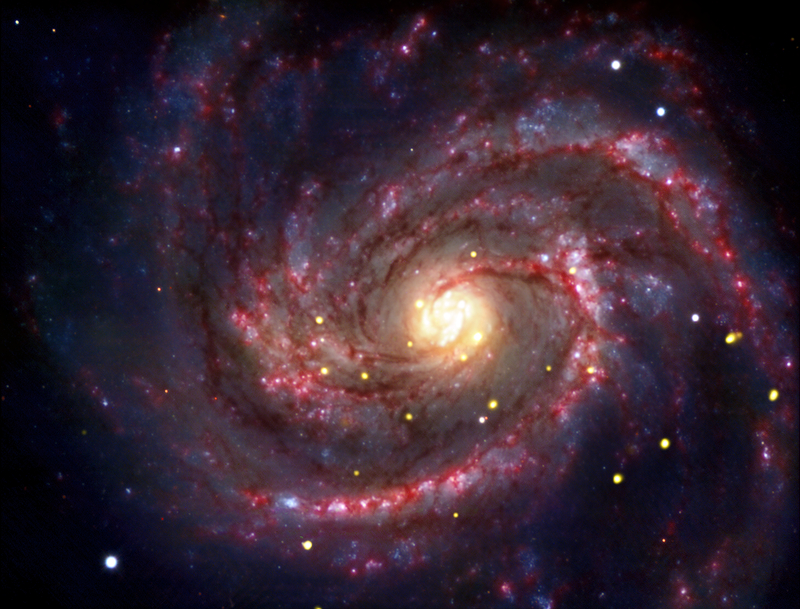 The galaxy M100 is located in the Virgo Cluster about 50 million light years from Earth. This approximately 30-year age, plus its relatively close distance, makes SN 1979C the nearest example where the birth of a black hole has been observed, if the interpretation by the scientists is correct. Data from Chandra, as well as NASA's Swift, the European Space Agency's XMM-Newton and the German ROSAT observatory revealed a bright source of X-rays that has remained steady for the 12 years from 1995 to 2007 over which it has been observed. This behavior and the X-ray spectrum, or distribution of X-rays with energy, support the idea that the object in SN 1979C is a black hole being fed either by material falling back into the black hole after the supernova, or from a binary companion. The scientists think that SN 1979C formed when a star about 20 times more massive than the Sun collapsed. It was a particular type of supernova where the exploded star had ejected some, but not all of its outer, hydrogen-rich envelope before the explosion, so it is unlikely to have been associated with a gamma-ray burst (GRB). Supernovas have sometimes been associated with GRBs, but only where the exploded star had completely lost its hydrogen envelope. Since most black holes should form when the core of a star collapses and a gamma-ray burst is not produced, this may be the first time that the common way of making a black hole has been observed. Coordinates (J2000) RA 12h 22m 54.9s | Dec +15° 49´ 21"
A supernova in the galaxy M100, may be the youngest black hole in the so-called local Universe. By combining Chandra's X-rays, optical data from ESO's Very Large Telescope and infrared data from Spitzer. 72,000 x 58,000 light years. 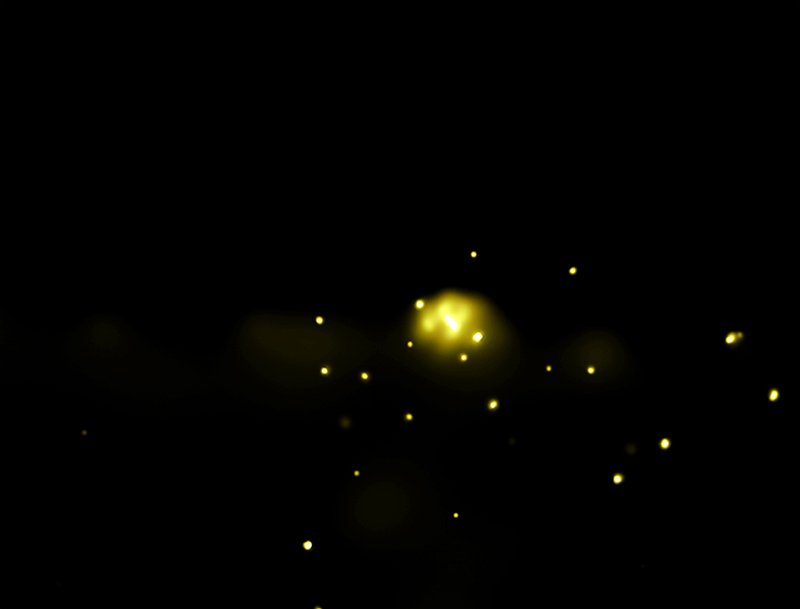 Chandra's X-rays are colored gold, while optical data from ESO's Very Large Telescope are shown in yellow-white and blue, and infrared data from Spitzer are red. In the constellation Coma Berenices.